iTunes' Cover Flow gets all the attention, but let's be realistic: It's a pretty inconvenient way of selecting music. Suppose, for example, you want to play all the Brendan Benson in your library. Cover Flow is useless: It's designed expressly to play an album at a time. You can switch to Grid view, choose the Artists filter, and then hunt for Brendan, but I find that a somewhat cumbersome approach. Indeed, I prefer iTunes' browser view, which you can access by pressing Ctrl-B (Cmd-B on the Mac) or clicking View, Show Browser. The result is a multi-window grid you can use to drill down into your library by genre, artist, and/or album. Click a genre in the left window, for instance, and iTunes immediately filters the artists and albums accordingly. 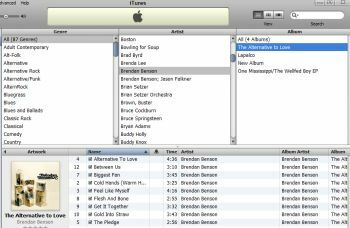 Or, to follow the previous example, I can just scroll down the Artist window until I find Brendan Benson, then double-click the entry to queue and play all his tracks. Prefer to stick with album art? A tap of Ctrl-G (or Cmd-G) adds artwork to the lower column, the one that lists all your tracks. This isn't a new feature by any means, but it's one I think flies below most users' radar. Give the Browser view a try and let me know what you think.